Getting a racehorse to the racecourse takes hours, in fact years, of careful planning and patience. Here we provide a short guide to the stages of development of a racehorse. There are two main routes to the training barn. The first is for home bred horses where our own broodmares are covered by stallions and the foals are born and raised as yearlings until they are ready to be broken in and trained. We also buy yearlings and younger horses from the sales. These are either put into training to race when they are two or three on the flat, or kept as 'stores' to race as older horses, usually with a jumping career. 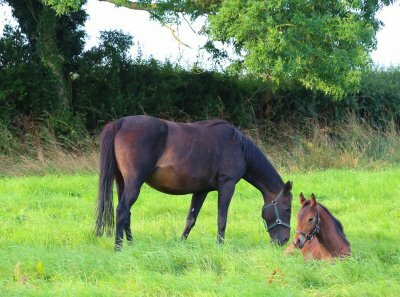 We provide a guide to our breeding and bloodstock services and details of some of our broodmares here. This is Bow Bridge who has been a very successful broodmare. A Listed winner herself she is the dam of numerous winners including Bowson Fred. We have many broodmares in the fields and these are covered by stallions and put in foal. 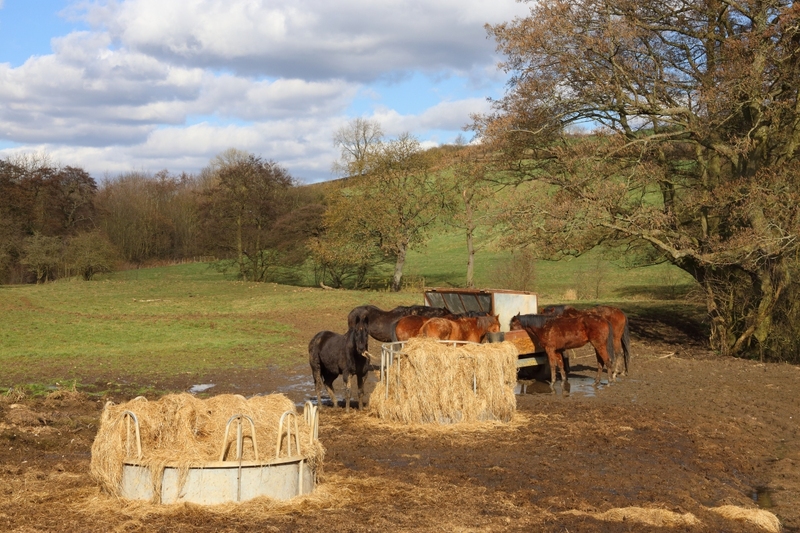 The foals will be kept with their dams until they are old enough to go out in the fields around the stables. This is Aetna and her 2018 foal who is by Iffraaj. After a few days inside the mares and foals venture out into the paddocks to get the sun on their backs! This is Be Lucky with her colt foal. The paddock next to the stables is one of the many used to accommodate mares and foals. Some of the foals, along with their dams, will move on to other locations to develop before coming back to the yard for training. The yearlings are turned out in the fields to grow! 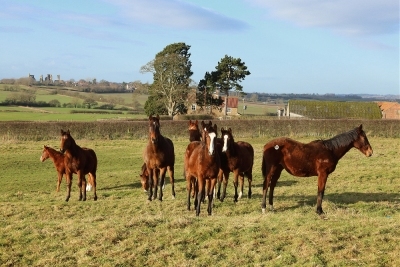 This picture shows young horses who have just turned yearlings a few days previously being looked after by Blue Spinnaker. Like all of our horses, the yearlings are given high quality feed to put on condition and muscle and to help them grow. At all stages of their development what they eat is vitally important, and as yearlings they are growing into strong athletic racehorses. Our yearlings spend the first year of their life out in the fields. 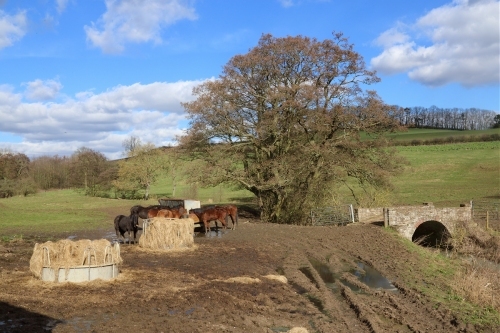 They have acres of space to enjoy, with streams and at one farm there is a bridge that they can cross to the hillside. Towards the end of the summer the yearlings are rounded up in the fields and brought in for training. They have been semi-wild for their first year so there are some interesting results when they first come into the yard. 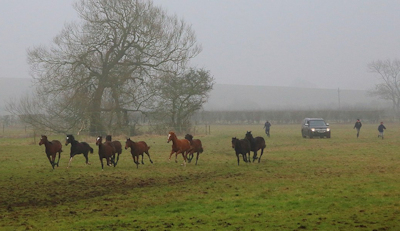 Towards the end of the year yearlings also arrive from the Sales. We buy yearlings from the top sales including Tattersalls and Doncaster. The yearlings join our homebred young horses and their training starts either in preparation for racing on the flat the following year, or otherwise as stores for a career as an older horse. A yearling colt having his first experience of the sandpit. A yearling is lunged in the sandpit. The young horses can be unpredictable and a protective helmet is essential. A young horse who is getting first experience of training. This yearling is getting used to steering with Jamie. Once the yearlings have been broken in it is time for them to learn to be ridden. Here they are in the barn with Nathan and Harrison riding and the horses are learning to trust their riders. For flat horses an important part of their training is to learn the starting stalls, as behaviour at the stalls is vital if the horse is to run its race and also get away quickly. 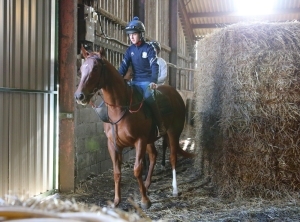 The picture shows a two year old filly learning the starting stalls! Here we see two year olds getting ready to make the debuts. 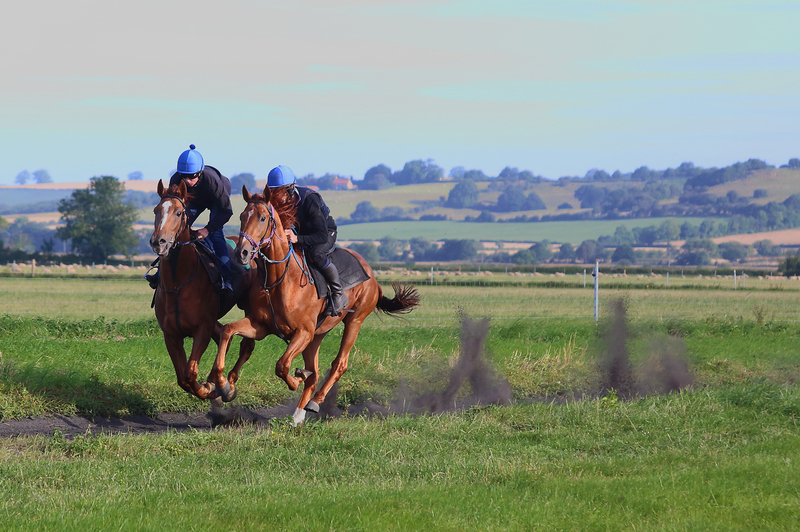 The horses are training alongside one another to get used to racing with other horses. After much work and patience, here is the finished article. 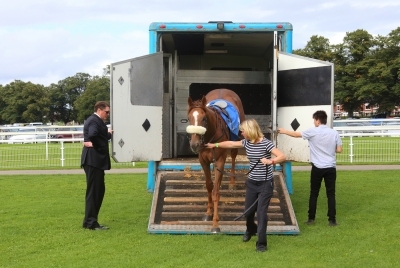 This is Aelius arriving at York led out of the box by Sarah Finch as David Easterby looks on. He is a big strong gelding by Sepoy and was purchased from the Tattersalls Yearling Sales in October 2015. 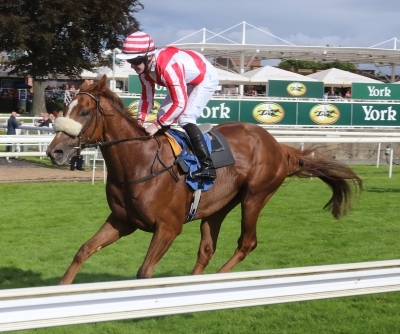 Aelius finishes at York having made his racecourse debut. 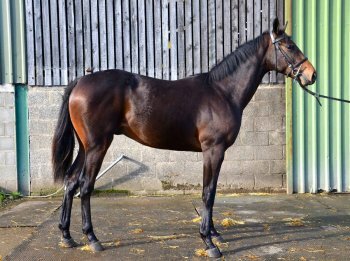 A huge amount of work has gone into transforming a young horse into a fully fledged racehorse and hopefully he will progress and win races as he learns his trade.